This is a fun recipe to make with kids. So simple! The idea was in a very nice cookbook, called Sweetapolita, which I very highly recommend for those who have been bitten by the Baking Bug. 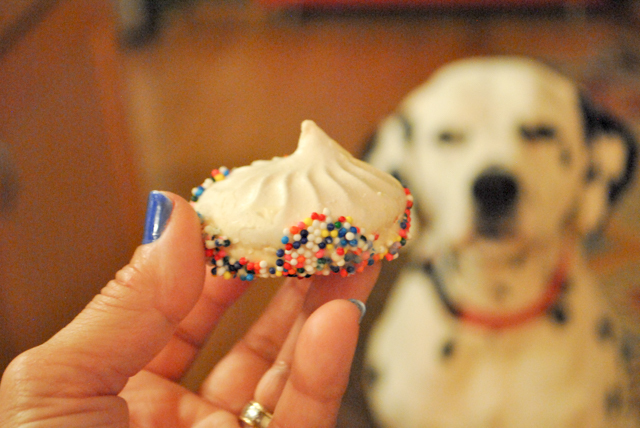 I haven’t asked for permission to share her recipe and method to make meringues (she has a few little tricks up her sleeve), but you can definitely use any meringue recipe out there. The secret is to bake them slow and low, and allow them to dry for a while inside the closed, turned off oven. I used a closed star tip to pipe mine, but you can go with a regular piping tip, or even just use a spoon. 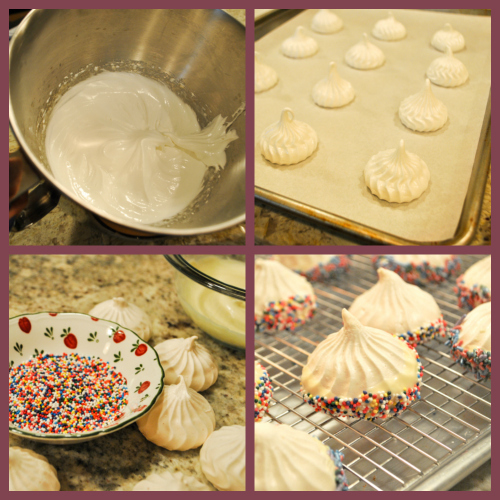 For a classic meringue recipe using the French method click here. After they are done, you melt some white chocolate, and add your favorite type of sprinkles into a small bowl. 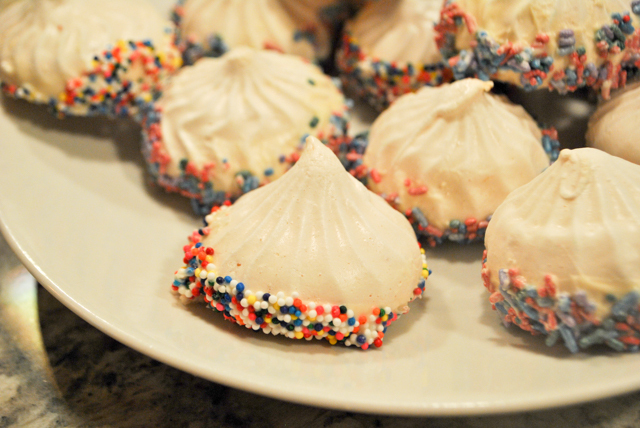 Dip the bottoms of the meringues in chocolate, then coat with sprinkles. It is a bit tricky to get the amount just right, but no matter what you do, they will be a ton of fun to make and eat. You can customize the color of your sprinkles too, of course. Maybe your favorite team is playing in the World Cup? Or your kid’s team will have a nice baseball match and you are the one in charge of loading them with sugar after? Any kid will love these! I’m always using a little bit of gel color in the piping bag :), so I have different shades in the meringues. What a great idea! I make meringues every year for my church. Will be making them with sprinkles next year! These are adorable, and BQT’s face! so cute! I can see one kid who is ready and waiting! !